Yes, it’s true. You can make your own organic, all natural coop refresher, and it won’t even cost you a million dollars. Learn More about Types of Chickens with the Backyard Chicken Bundle! Click here to learn more about the Backyard Chicken Bundle! While I love the commercial coop refresher products you can buy, there came a day on the farm when we NEEDED something to squelch the stench in the rabbit coop and the chicken coop. And by squelch, I mean eliminate completely. We needed a coop refresher and we needed it NOW. It was one of those hot fall days when you never know what to expect – it can be 80 degrees during the day (yeah!) and a kit-and-chick-killing 42 degrees at night. (Here’s how to prepare your chicken coop for winter). We keep the coop very clean, but at those temperature swings, it doesn’t take much to make me worry. After we cleaned out all the straw, I wasn’t satisfied – something was needed to make the coop extra clean. Now, here’s the thing. We live 45 minutes from ANY sort of store that might sell a commercial chicken coop refresher. And it was Sunday evening. Running to town in order to buy something like a chicken coop refresher just wasn’t going to happen. But something needed to happen – fast. So, I improvised. And it worked so well, that we now ONLY use my favorite organic all-natural coop refresher recipe on the farm. It costs less than a few dollars, and last a good long time. And your chickens will be happier and healthier for it. So, the purpose of a chicken coop refresher is to soak up any animal waste and neutralize the odors so your chicken flock doesn’t breathe in ammonia or other fumes that can harm them. Now, I don’t have anything against commercial chicken coop refresher products. But I don’t think they’re always necessary. I think – no, I KNOW – you can achieve the same results for a coop refresher with basic ingredients you probably have in your home right now. That day that one fall evening when I was in a panic, it dawned on me that two simple ingredients – flour and baking soda – could produce the same effect we might spend a lot of money to solve. Think about it – flour is extremely absorbent. We all know that from making bread. If you use organic flour to make your own coop refresher…well, you’ve got an organic solution to your smelly chicken coop. Baking soda is the gold standard for neutralizing odors – that’s why we’ve kept it in our refrigerator since our childhood. Why couldn’t it also be used in a homemade coop refresher to neutralize odors from chicken waste? Well, it can. And it costs less than $1. Particularly if you’re worried about using diatomaceous earth or something like lime, this combination can be a good solution while not sacrificing a clean chicken coop. While the flour and baking soda particulates won’t hurt your flock, it’s still a good idea to allow the dust from your all natural coop refresher to settle (so to speak) before allowing your hens back into the coop. Now, I’m kind of making a production out of this all-natural coop refresher idea, but the truth is the ratio of baking soda to flour is not as precise as, say, the ratio if you were baking. Typically, I go for a 5-pound bag of flour and mix in 1 small box of baking soda in a 5-gallon or painter’s bucket. Once you’ve put both ingredients into the bucket, thoroughly mix (I use a feed scoop, you can use a big spoon if you don’t have a scoop), and get to sprinkling. You’ll notice the smell start to neutralize fairly quickly, assuming you’ve done a good job cleaning your coop as thoroughly as possible. 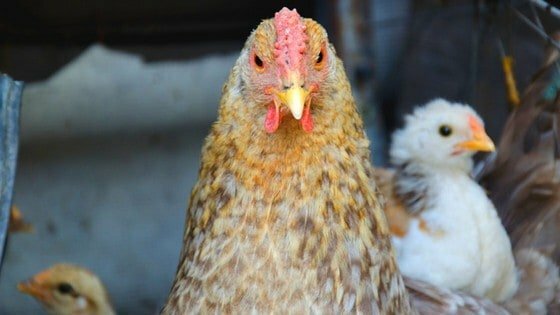 Learn how to clean your chicken coop like a pro! (If you have puddles of urine everywhere, then you might need just a tad more coop refresher. Or a few bucketfuls.) And if you’re having problems with flies in the chicken coop, click here to read how to keep flies out of the coop. Sweep out, resprinkle the coop refresher, and sweep out as necessary. I personally resprinkle a final layer of my homemade coop refresher and put straw on top. You can do whatever you feel is best for your flock. It’s easy, it’s fast, and it’s cheap. I guess for once, you really can have all three. Happy sprinkling! Does the Deep Litter Method Really Work? 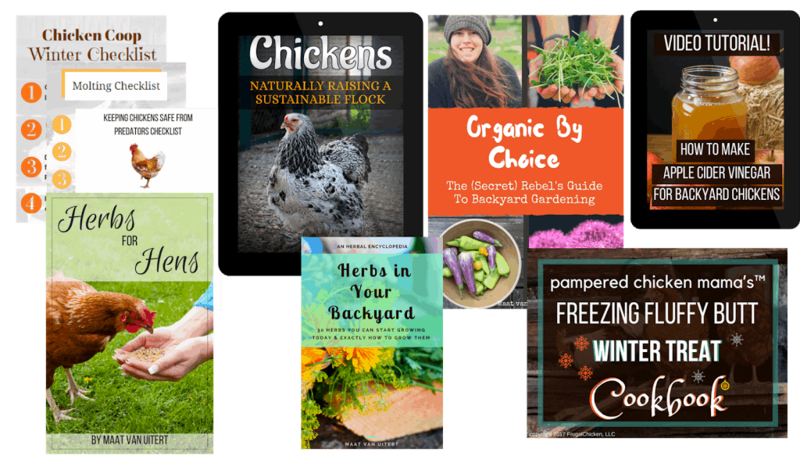 5 individual ebooks with over 40 gorgeous full color photographs, charts, and recipes for all-natural coop cleaners, layer feeds, herbal first aid salves, and more. E-books naturally complement each other so you have information at your fingertips. 3 downloadable checklists to save your flock from bad weather & predators, and to keep them healthy while molting. 1 Apple Cider Vinegar for Backyard Chickens video that shows you step-by-step how to make organic apple cider vinegar in your own kitchen. Information you can TRUST by a recognized backyard chicken expert featured in Reader’s Digest, Glamour, and on major news networks like ABC, CBS, & NBC. And START spending every possible minute playing with & enjoying your pets (without the worry)! How do you keep it from turning into a doughy mess? I just imagine any moisture would make it gooey and sticky. I brush out the initial layer that soaks up any urine, etc. Then I lay a 2nd layer of the coop refresher, then a layer of bedding on top. Usually straw.. I’ve never had it goop up. What if you have a dirt floor in the coop and can’t sweep it out? It’s a bit harder with a dirt floor because everything gets soaked in. How do you clean it now? Do you scrape the manure out? great idea.will do when it gets above 10 degrees.just clean as much as we can for now.any ideas just to spray in the coop now. You can still sprinkle it in there to at least soak up some of it if the temps are so low that everything’s frozen. It’s difficult to advise more than that because anything else is basically a Bandaid until the old bedding comes out. Another option is to spray with an herbal or essential oil based spray (with lemon and oregano essential oil, for example), but that’s also pretty much a Bandaid. We’re in a similar situation with our rabbit coop, it needs cleaning but everything is frozen solid. I keep putting straw on top so they can stay warm.